"The staffs are so kind friendly and helpful." 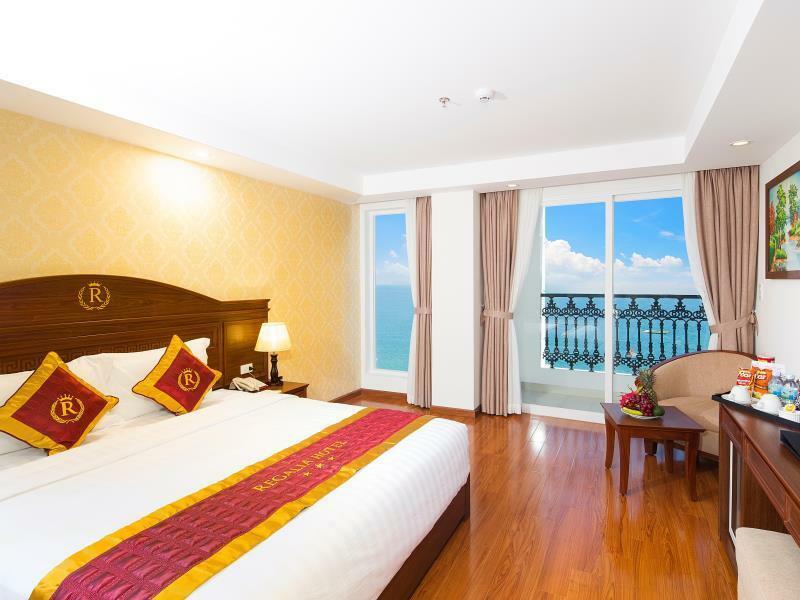 Have a question for Regalia Nha Trang Hotel? "The location and cleanliness of hotel is good." "The hotel room are clean and comfortable.the staff was helpful and friendly especially a female with golden hair front office attendant [thu]." 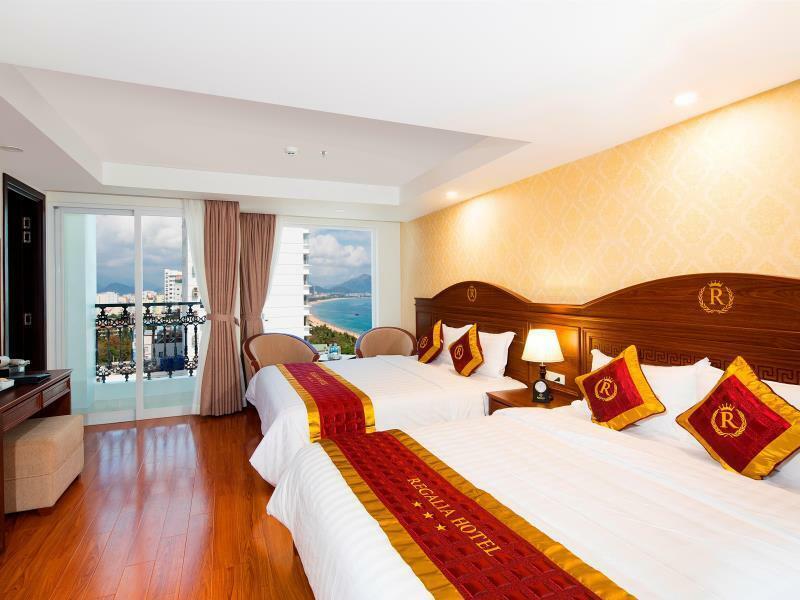 Regalia Nha Trang Hotel, located in Loc Tho, Nha Trang, is a popular choice for travelers. 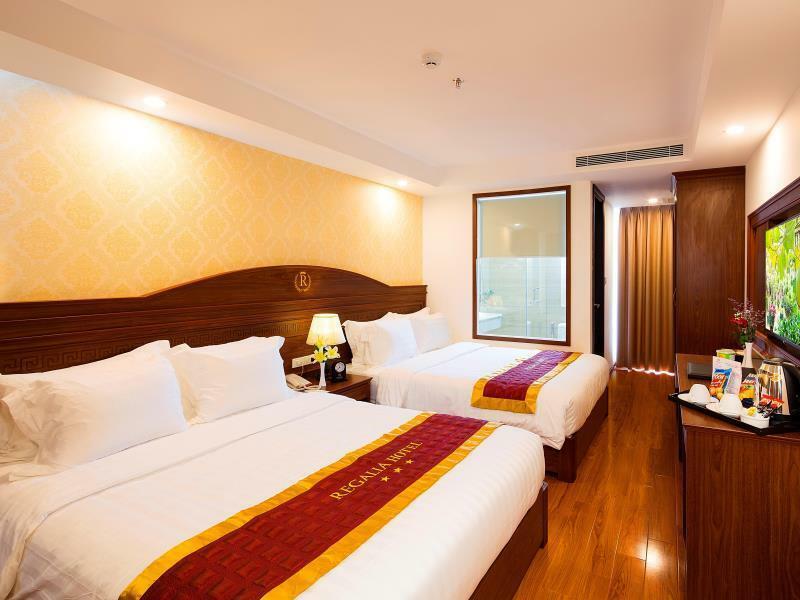 Set 2.4 km from the excitement of the city, this 3.5-star hotel commands an excellent location and provides access to the city's biggest attractions. With its convenient location, the hotel offers easy access to the city's must-see destinations. At Regalia Nha Trang Hotel, every effort is made to make guests feel comfortable. To do so, the hotel provides the best in services and amenities. While lodging at this wonderful property, guests can enjoy free Wi-Fi in all rooms, daily housekeeping, gift/souvenir shop, taxi service, 24-hour front desk. Step into one of 103 inviting rooms and escape the stresses of the day with a wide range of amenities such as television LCD/plasma screen, complimentary instant coffee, complimentary tea, mirror, slippers which can be found in some rooms. Throughout the day you can enjoy the relaxing atmosphere of the private beach, outdoor pool, billiards. 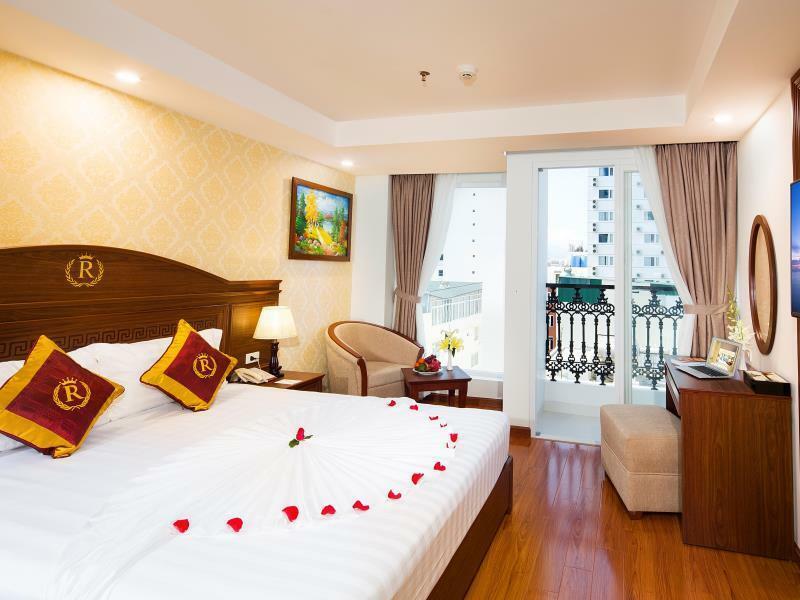 Whatever your purpose of visit, Regalia Nha Trang Hotel is an excellent choice for your stay in Nha Trang. "The best part of the hotel is that it is near the beach." Maximum 1 child under 11 years of age is allowed in each room. Child under 6 years of age stays free of charge when using existing beds. Child from 6 to under 11 years of age is charged directly at hotel upon check in for breakfast when using existing beds. Guests from 11 years old are considered as adults. The best part of the hotel is that it is near the beach. Bear in mind that the sunchairs in front of the hotel are only available for guests until 5pm, which was a little annoying when someone came over to ask for money while I was sunbathing. The only complaint is the lift and internet is slow as a turtle walking. We booked a suite with Ocean View and our room did not disappoint. The room was very nice,clean and well appointed. The problem is, the hotel is located RIGHT ACROSS from a parking lot that handles tour buses.Which mean EVERY morning you heard the noisy horns and the beep beep beep of these buses backing up. On the balcony all you saw was waves of Chinese tourists getting off buses making all sorts of noise and almost getting run over since they had no idea how to cross a street in Vietnam. Breakfast was really nice no problems at all. After many trips to Nha Trang over the years, we will not go back. Overcrowded with rude Chinese and Russian Tourists. Pros: Good location Large room seaview with balcony 1202 Breathtaking view Good spread of breakfast Airport transfer VD350k per 7 seater car Good english command staff Clean housekeeping Strong water pressure Hot water very good Hotel nearby great massage shops 150m to Halal Restaurant Omar Tour agent with good English spoken please wassap direct Mr Lam +84 91 405 37 61 (highly recommended) Cons: Noisy as infront of busy street Breakfast will be better if they consider more halal spread for Muslims Swimming pool in level 16 need to refill and clean Only one card access for one room, our fruits and yogurt spoiled when we left in the minibar with no electric supply whole day when we were out for tour We were very happy with our 3nights stay in Regalia. Please book seaview with balcony room. You wont regret it. We had great tour with Mr Lam who speaks good English. We had Da Lat tour and country side tour with him in his private car. We stayed 4 nights at the Regalia Nha Trang Hotel. The room was very large and the sea views were amazing! It was nice to have a separate bathtub and shower - although the shower had so much pressure and warm water I didn't ever choose the bath! The breakfast lacked some basics but there was enough to keep the hunger away. The staff were very kind, but we didn't seem to find anyone that could understand us very well. We had a lovely seaview room, but as it was the top floor it was right underneath the pool! The pump ran all night on the 3rd and 4th nights - and I was unable to make them understand my rather desperate request "Can you turn the pump off"?! It rumbled and vibrated all night which really affected my sleep the last 2 nights. I would stay at this hotel again, even in the same room type, but I would make sure to request one floor down so the pump would not affect my beauty rest :). Alternatively, might I recommend they turn the pumps off from 11pm - 7am? BIGGEST ISSUE HERE WAS THE FRIDGES IN THE HOTEL ROOMS WERE WARM!!! Basically room temperature which meant milk and beers were warm. Asked if they could be turned to a cooler temperature and was told "No". Other than that, this hotel is just across from the beach and had a lovely breakfast. Pool was not covered so it was not ideal on rainy days. The hotel is located around plenty of shops, convenience stores, local restaurants, and spas. Would highly recommend this hotel. Great location for exploring the city and access to the beach. Very clean and comfortable rooms. Excellent helpful staff. Breakfast is great value. We enjoyed our stay so much that we stayed an extra night. La localisation est très bien. J'avais une très belle chambre et très moderne ( partie vitrée entre la pièce chambre et la salle de bain: j'adore ) avec une très belle vue sur la mer, plage et promenade et aussi de mon balcon vue sur la cité !! Le buffet du petit-déjeuner est très, très bien et complet. Que dire du personnel : Excellent, Sympathique, Serviable, et plus. Cuong, qui travaille à la réception , est très serviable et très agréable. Merci et Bravo. Seul petit bémol, l'appareil , en chambre, qui sert à rafraichir les boissons n'était pas assez froid comme j'aime. 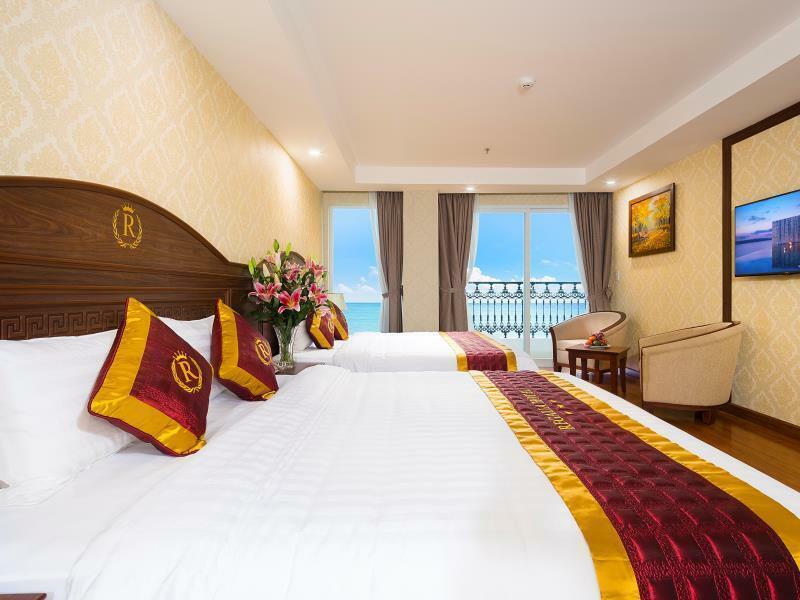 Set directly across the road from the beach with its own little allocation of sand and lounges Regalia Nha Trang Hotel was the perfect place to stay. The hotel is small in comparison to some of the high rise accommodation surrounding it but where the overall size was not huge the feeling of comfort and welcome were. 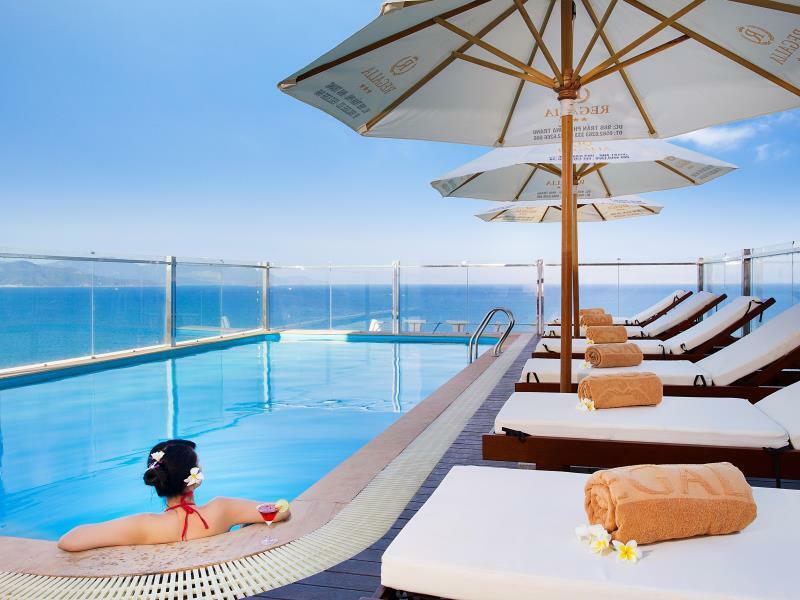 The 16th floor pool gave you magnificent views across Nha Trang and there was an absolute feast of world food to dine on along the street frontage outside the hotel. Our room was spacious and very comfortable and breakfast was quite good with lots to choose from. The staff were friendly and helpful and everything Nha Trang has to offer is within easy reach from this wonderful hotel. This hotel has everything you wanted. Breakfast had plenty of choice. The room was very clean. We booked a sea view executive room and trust me you won’t be disappointed with the view! The staffs were very helpful too. Check in and check out process were smooth and we would like to thank especially Minh Thu for making it possible. 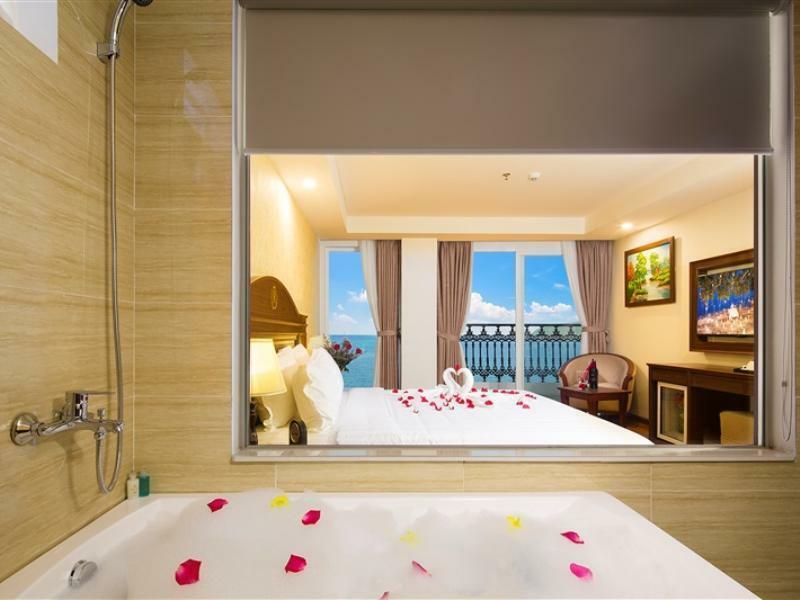 If I ever come to Nha Trang again, I won’t hesitate to book at this hotel again! Worth every penny, I stay at executive seaview room 501, great staff, good location, comfortable room, the room got safety box, slipper, bathrobe, bathtub, refrigerator, balcony, and the seaview is great too! The Male Staff is very helpful and gv us lot of information and help, and the top side of hotel got a small swimming pool with A great view, breakfast also included in the package, overall I’m very satisfied what I paid for the hotel! Perfect! Thumbs up! The hotel is well located along the town street. Most importantly there is a street market 2 mins away from the hotel. If you are looking for dry foods, you will be able to get from there. The beach is just right opposite the hotel so you are able to have sea view everyday. There is no parking lot, i have to park my car at the parking lot 200m near the hotel with 200k VND per night, terribly! The construction quality of the whole building is quite doubtful to me, the water leaks from under the bathtub, later I realized they just tug the tub in without sealing it to the walls. So the water leaks from the inner side when you shower, even when you pull the curtain. Then later we found out that the reason why it's super noisy in the room is because the window frame is too large for the windows, so there's always a crack and that's where the noise comes from. I am a very seasoned traveller and personally in Hospitality business. Regalia Nha Trang have definitely surpass my expectations of any 3 star hotels and i would highly recommend to anyone planning a holiday in Nha Trang. Very clean spacious room, friendly and very helpful staff. The buffet breakfast was great. As good as any 4 or 5 star hotel breakfast in Vietnam.